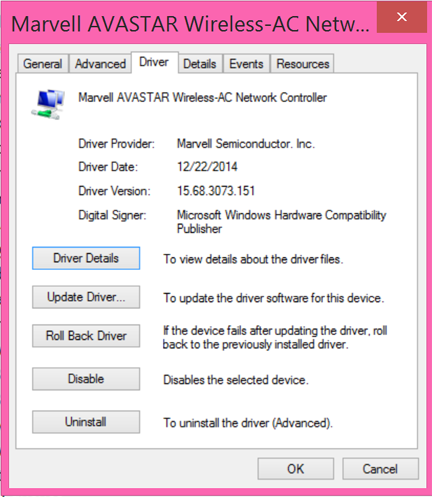 On January 15, 2015, Microsoft released a package of drivers to Windows Update that includes an updated Marvell WiFi driver for the Surface Pro 3. 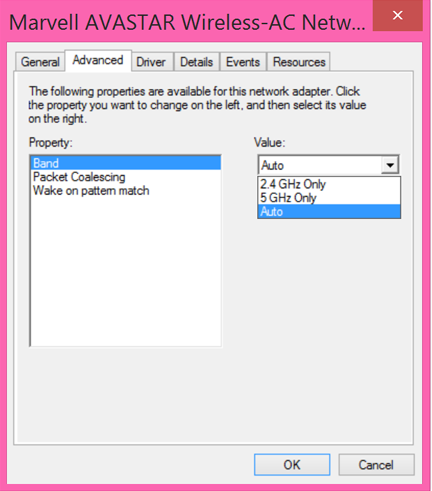 If you are one of the folks that has been trying to resolve issues of connecting to 2.4GHz instead of 5 GHz on your dual band router, this new driver includes settings to fine tune your connectivity preferences. 1. Type the words device manager on the Start Screen/search and then open device manager. By default, the Band is set to Auto in the Value field. Access the dropdown list and select 5GHz if you want to connect to only the 5GHz band. Note that the 5GHz band is the one that provides the 802.11ac speeds. You can also specify 2.4GHz only. Important: If you change locations and have specified a setting other than Auto, you should change the setting back to Auto to insure connectivity “on the road”. This is especially important when using public WiFi which normally uses the 2.4GHz band.